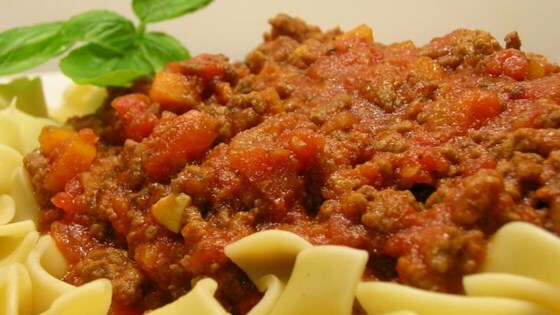 "A very thick and hearty meat sauce simmered in the slow cooker." Heat the olive oil in a large skillet over medium heat, and cook and stir the carrots, onion, and garlic until tender, about 10 minutes. Place the ground beef into the skillet and cook and stir, breaking up the meat as it cooks, until browned. Drain off excess fat from the skillet, and pour in 1 cup milk. Bring to a simmer, reduce heat to medium-low, and simmer until the milk is absorbed, about 15 minutes. Place the beef mixture into a slow cooker, and set the cooker to High. Stir in crushed tomatoes, tomato paste, salt, pepper, basil, oregano, and red pepper flakes, and cook for 2 hours. Mix in 1/2 cup milk and Parmesan cheese, stir well, and cook for 2 more hours. You can use a beef, pork, and veal meatloaf mix instead of the ground beef, if you prefer. So many people make so many changes and then post their stupid comments. If you have your own way to do it post your own and stop waisting our time with your bable.